While car manufacturers and tech companies around the world work to make autonomous vehicles a reality, two UNC researchers are raising some important questions about the impacts — both positive and negative — that this massive change will have on our daily lives and public health. What will our world (and our health) look like when we no longer drive our cars? Over 30,000 Americans die in car accidents every year — 94 percent of those fatalities are caused by human error. Around the world, approximately 1.2 million people lose their lives in car crashes each year. What if we could eliminate all car accidents caused by human error? That is one of the main arguments made by proponents of autonomous vehicles — safety. Our country, and the world, is on the cusp of a revolution in transportation technology and infrastructure. While industries are focused on perfecting the technology, and consumers are skeptical about trusting it, researchers face a blank page — there is no pre-existing data. We consider a new technology to be “disruptive” when it changes the way everything happens — airplanes, the Internet, and smartphones are just a few examples. Disruptive technologies often upend existing regulations and can render current infrastructure obsolete — consider pay phones in a world where everyone has a phone in their pocket. Much of the debate about the pros and cons of driverless cars comes down to control. Humans are reluctant to relinquish control of their vehicles — how could a computer possibly cope with the nuances of an icy road or avoid a pedestrian stepping into traffic? Meier and Crayton want to ask the questions that will help frame policies that will be most beneficial to public health. While the idea of a self-driving car still seems a bit too futuristic for many, thousands of people are already driving cars with fully automated features. 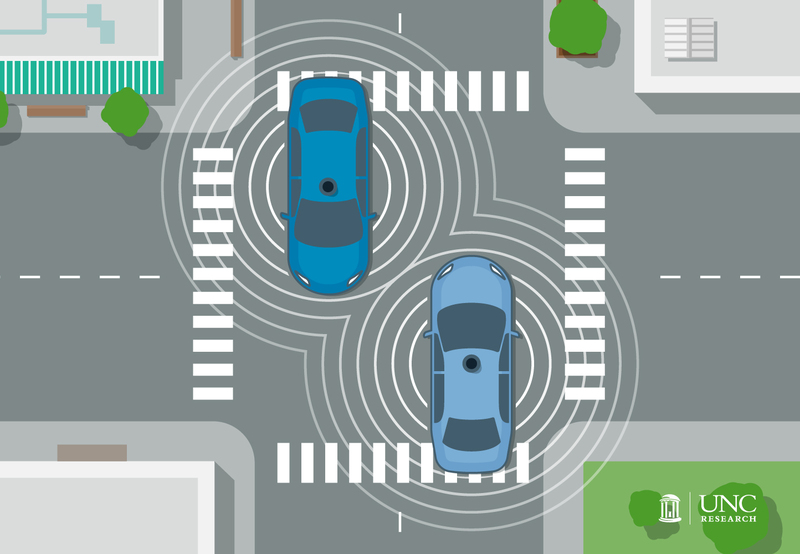 Many car companies have developed their own systems for automated features, like Acura’s Collision Mitigation Braking System or a Lincoln MKZ with Active Park Assist, which can parallel park itself. But these features are just a glimmer of what the future holds. “What we’re talking about is moving to a fully automated system where there is no need for human input,” Crayton says. The long term vision is a fully automated transportation grid where all elements of the infrastructure are able to communicate with each other, potentially eliminating two of the worst components of driving — traffic and accidents. “Some people say you might not even need traffic lights if you have a fully automated grid,” Crayton says. A world without traffic. How would that change our cities? How would that change us? Consider this scenario: what if you could work in a major downtown area and live in the suburbs without losing several hours a week to commuting? With an automated transportation grid, not only would your commute be shorter and safer, you could do all the things you’re not supposed to do while driving — make phone calls, send texts, check e-mails, read, or even sleep. Such an easy (perhaps even luxurious) commute to work might create more incentive for people to live further away. Encouraging individuals to walk or bike to work — activities that improve cardiovascular health and reduce the rates of obesity — is a major public health initiative across the country. But the convenience of automated vehicles might result in people walking even less than they do now. “If people start using their cars more than they already do, that could increase cardiovascular disease, obesity, and diseases caused from lack of exercise and movement,” Crayton says. At this point, it’s still unclear which technologies will prevail in this new transportation world, creating uncertainty about environmental impacts. “Will these be electric vehicles that don’t produce emissions?” Crayton asks. If so, that could greatly decrease the carbon footprint generated by millions of cars. But if these new cars aren’t environmentally friendly, the introduction of these vehicles could exacerbate some of our most pressing issues related to environmental health. While the development of driverless cars is driven by consumers and profit motive, the technology has sweeping implications for health well beyond the intended market, according to Meier. In many rural, remote areas of the world, lack of transportation impedes economic development. What could driverless cars do for economies (and public health) in those places? Across the world, from mail carriers to truckers to taxi cab drivers, millions of people hold a job that requires driving a traditional vehicle. Gainful employment is an important determinant for health, according to literature Meier and Crayton cite in their paper. What happens to the health of our population when we no longer need drivers? While this new system may sound like bad news for those currently employed in the transportation industry, it could open whole new worlds for people who can’t drive. Research that Meier and Crayton cite shows that getting out of the house extends your life and your well-being. Autonomous vehicles could provide a whole new level of independence and autonomy for the disabled and the elderly. And what about the national government? Where are they in all of this? In September 2016, the National Highway Safety Administration published the Federal Automated Vehicles Policy, a major policy guidance on autonomous vehicles and one of the first government documents of its kind. Last year, 20 states introduced legislation related to regulating autonomous vehicles. So far in 2017, 33 states have introduced legislation. California is leading the charge, allowing driverless cars on state highways this year. One obvious concern for public health in the short term is the transition — having traditional, cars and fully automated vehicles on the road at the same time could increase fatalities. “You will see these different types of technologies trying to interact and there’s a chance for adverse impacts there,” Crayton says. Both he and Meier believe the future of transportation will take the shape of a fully automated system. But it’s a good start. Outlining the many links between the introduction of autonomous vehicles and the potential impacts on public health is crucial. Travis Crayton is a dual-degree master’s student in the UNC School of Government and the Department of City and Regional Planning in the College of Arts & Sciences. Benjamin Mason Meier is an associate professor of global health policy and the Zachary Taylor Smith Distinguished Professor of Public Policy in the College of Arts & Sciences. Their research appears in the Journal of Transport and Health.